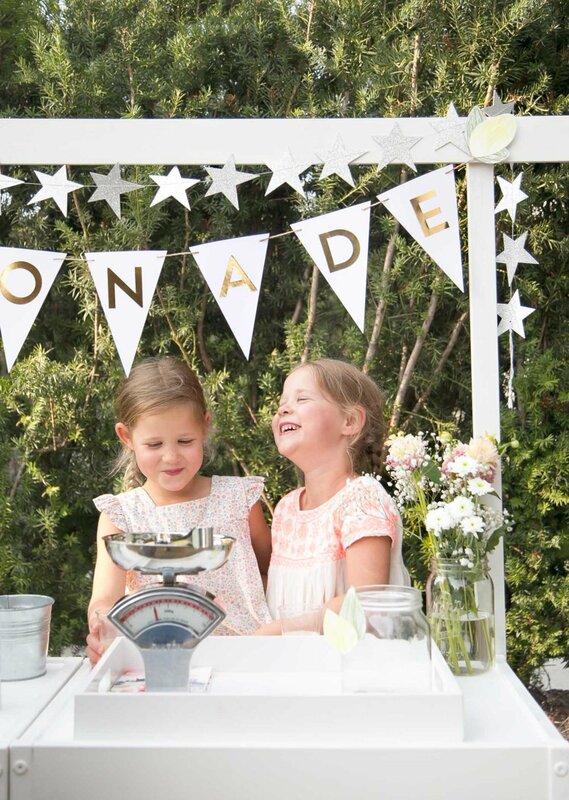 They say it's a right of passage to have a lemonade stand as a child. I say throw two IKEA LATT kids tables together, paint them white and you're set to go!!! 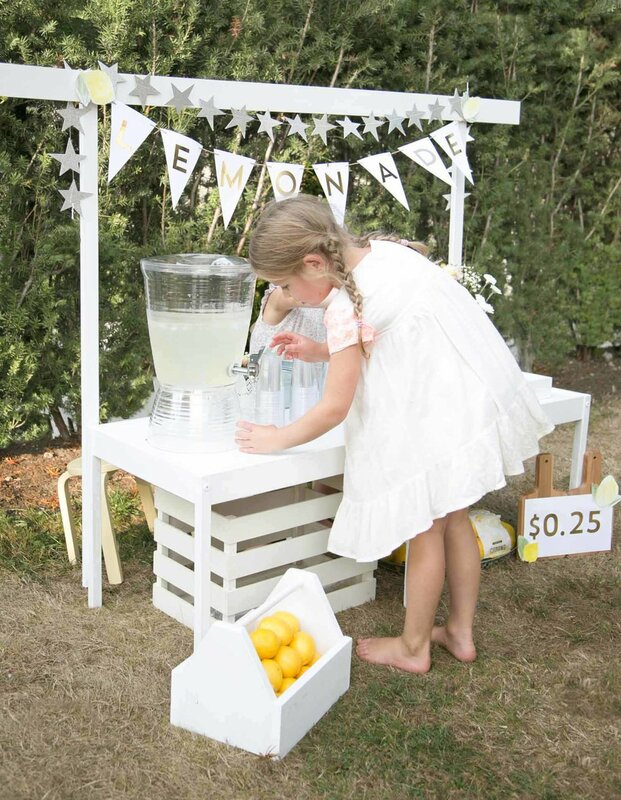 Our daughter Noelle, who is 6, told me a few nights before school started that having a lemonade stand was on her list of 'must dos' for the summer and she seemed pretty set on it. Without having much time to think about it, we put the kids to bed, I found the two IKEA tables in the basement and a few pieces of scrap wood and set to work (big thanks to my hubby for screwing the wood into the tables enabling a stand to be made). Our IKEA kids tables mainly get used for parties or when kids come over for playdates and were definitely not in the best shape, so after finding the pieces of scrap wood to use as the 'stand', I used some leftover paint from my playhouse project last summer and quickly painted it all. You can see how dark it was when I snapped a photo once the paint was on. This is devoted parenting at its' best, right?! Ha! 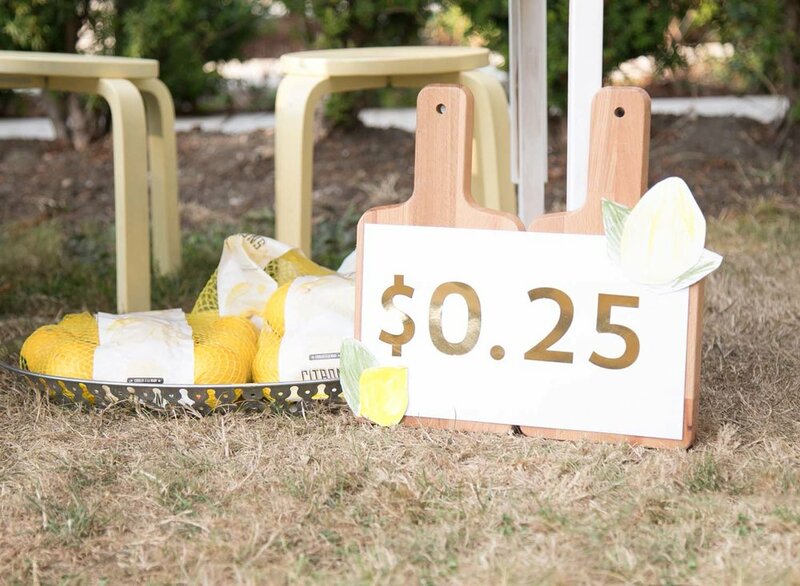 I made the 'LEMONADE' sign the next morning by cutting out large triangles from card stock and sticking some gold foil letter stickers on. I already owned the drinks dispenser that we use all the time for parties and playdates and apparently now lemonade stands too!!! The adorable silver star garland is from Pearl and Jane on Etsy. The girls and I walked up to the flower shop to choose some flowers for the stand and they picked out this sweet combination themselves. They also drew, coloured and cut out the lemons and stems to stick onto the stand for decoration. Aren't they the cutest?! This is definitely my favourite detail of all!!! Everyone who came by commented that at 25 cents, our lemonade was the best deal around. I guess we wanted the stand to be about having fun and not making money and we even had a jar of quarters for anyone who came by who didn't happen to have change with them. This turned out to be a great idea as we could then give out free lemonade (therefore getting more 'customers') while the kids could transfer a quarter from our money jar to theirs. Watching the joy on their faces when their neighbourhood friends stopped by was priceless; such a great summer memory.A win win for everyone! We have owned this little silver scale for years and it made a perfect accessory for the stand. The kids filled their own glasses up more times than I was willing to count but I suppose that's half the fun, isn't it??!! So, there it is. A summer bucket list item ticked off for the kids and hours and hours of fun for us all. Who else has a couple of IKEA kids tables kicking around?